All about herbs this week: we’ve got oregano, tarragon, thyme, parsley, rosemary, sage, dill, cilantro, and lovage! Once again, LOTS OF ASPARAGUS this week. 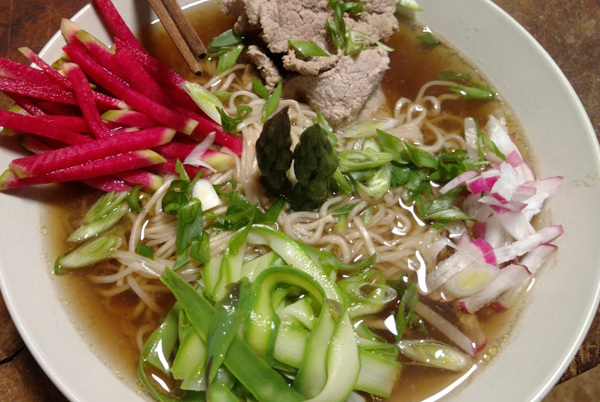 Tonight’s asparagus treat: Fasta ramen noodles with shaved asparagus, pickled watermelon radishes, & French breakfast radishes. Though we haven’t yet hit the time(s) of year when the produce table is overflowing with variety, things are definitely looking up. Right now, leaves abound — along with asparagus, radishes, and a few baby allium roots. The storage crops are waning. We’ll have sweet potatoes and winter carrots for just a few more weeks (my fingers are crossed the carrot stores will last until the first spring carrots come in), and it seems nearly every week there’s a less-popular winter vegetable falling off the list. Still, if you want real substance, these are things that remain. My goal for this week is combining the newly incoming spring treats with some of those outgoing roots and tubers, breathing new life into the staples we’ve been eating for the past few months. My favorite example so far (which I think we failed to take pictures of) was a big green salad of Village Acres mesclun mix topped with a parsley/cilantro/spring garlic chimichurri-inspired dressing, charred asparagus, a heap of shredded carrots and radishes, and some roasted chicken. Holy cow was it good. Still, though, it was much more of an indulgence in what’s new than it was in using up any significant quantity of the remaining winter veggies. I never did make the Sweet Potatoes with Yogurt and Cilantro-Chile Sauce I posted about some time ago, so I’m thinking about that one again. I’m also thinking about making some kind of mixed herb pesto for putting on everything, and of course I’m spending way too much time scouring the interwebs for wonderful asparagus recipes — but the season is so short, I want to eat as much of it as I can, in as many different ways I can, as long as we have it.